Patrons, businessmen, and wide-eyed travelers will once again be mesmerized by the hotel’s inescapable charms, both old and new. The $400 million restoration of the beloved Plaza Hotel is a throwback to an earlier time, where white gloves and polished silver platters were de rigeur. For two-and-a-half years, the historical landmark underwent a head-to-toe makeover, and its long-awaited debut is finally here. On May 10, high society, A-listers, and the international jet set will celebrate the Plaza’s renaissance with an elegant ballroom fête. The Opening Gala will commemorate the hotel’s famed history within the same walls that received the Beatles on their first U.S. visit in 1964 and on the very same dance floor that hosted Truman Capote’s legendary Black and White Ball. The Plaza’s reemergence creates the perfect balance between old tradition and new brilliance. Louis XV-inspired décor and 24-karat gold Sheryl Wagner sinks lend panache to the 282 guestrooms in the French château-style hotel, while old favorites like the Oak Room, anticipated to reopen in late spring, and the Palm Court remain intact with a revitalized elegance. 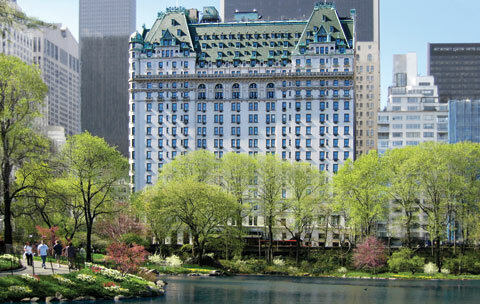 Built in 1907, the Plaza is the only New York City hotel that is a national historic landmark, and a concern for preservation has proved to be at the forefront of all renovations. Curators reconstructed the awe-inspiring 1,800-square-foot stained glass ceiling in the Palm Court, the famed location of the Plaza’s much-loved high tea. In the grand ballroom, neo-classical designs and colors have also remained consistent. Post-renovation, the Plaza pledges more than just a cultivation of its storied tradition. The architects redesigned suite layouts, added meeting spaces, and created contemporary lounging nooks. Boasting the greatest guestroom square footage among the city’s luxury hotels, the reopening further enhances the use of this space. The 102 guest suites present a choice of seven different layouts including a number of bi-level rooms and several more with garden-view terraces. A sweeping modernization of in-room technologies load each suite with flat screen TVs, Wi-Fi, video-on-demand, and even an innovative security system. A Guest Services Panel makes your personal butler or hotel concierge quite literally just a touch away. The new Champagne Bar with a bevy of toasting selections will now grace the lobby entrance, while the posh Rose Club is a highly anticipated addition to the Plaza’s nightlife scene. The soon-to-open Retail Collection encompasses 160,000 square feet and spans six levels; the luxury shopping space will indulge guests with premium lifestyle brands, which will include a Caudalie spa, a Radu fitness center, and a Warren-Tricomi hair salon. The Plaza has been reinvigorated. Patrons, businessmen, and wide-eyed travelers will once again be mesmerized by the hotel’s inescapable charms, both old and new. Its fabled past has been revived and embraced, and a sprinkling of modern glamour ensures its place as a staple in New York high society.